HEALTH MIDED . . .
Q: What is thirdhand smoke, and is it harmful? A: Everyone knows about the health risks of inhaling secondhand smoke, but even remnants of tobacco smoke that linger on various surfaces can pose a danger. Thirdhand smoke refers to nicotine and other particles that cling to clothing, furniture, carpets, drapes, and walls, as well as to a person�s hair and skin. Researchers have found that substances in secondhand smoke can react with other indoor pollutants to form potentially carcinogenic compounds. A 2013 study from the University of California at Berkeley�s Lawrence Berkeley National Laboratory specifically traced one such compound, nitrosamine, to genetic damage in human cells. More recently, the Berkeley Lab team published another study showing that thirdhand smoke continues to have harmful health effects several hours after a cigarette is put out. �Tobacco smoke residues lingering in the indoor environment, also termed thirdhand smoke (THS), can be a source of long-term exposure to harmful pollutants,� according to the study authors. People are exposed to thirdhand smoke by inhaling it, ingesting it, or through direct skin contact. Infants and young children are especially vulnerable if they crawl on floors or put fingers in their mouths. RELATED: Is Hookah Smoking Safe? �All tobacco smoke is toxic,� says Dr. Strelnick. �We know that its dangers are dose-related. Therefore, we can assume that the more time a nonsmoker spends in places where there is thirdhand smoke, the more likelihood there is of harm.� Exposure to secondhand or thirdhand smoke can trigger symptom flare-ups in people with chronic obstructive pulmonary disease (COPD). Research suggests that children exposed to cigarette smoke face nearly double the risk of developing COPD later in life. Once smoke residue builds up, routine cleanings, and opening windows to air out rooms, aren�t enough to get rid of it. Carpets and drapes may need to be professionally cleaned or replaced as well. �The only way to protect nonsmokers from thirdhand smoke is to create a smoke-free environment, whether that�s your private home or vehicle, or in public places, such as hotels and restaurants,� Strelnick says. Health Matters With Dr. Sanjay Gupta. Place 1 teaspoon of grapeseed oil in a large pan over medium heat. Add the carrots, onions, and a pinch of salt and let cook for about 10 minutes. Add the spices and mix well. Crumble in the meatless taco and mix in the water, tomato paste, and Dijon mustard. Finally, fold in the thawed peas. When the liquid has nearly evaporated, turn the heat off and let the flavors meld as you make your cauliflower mash. Place 2 cups of water in a steamer pot and bring to a boil. Wash the cauliflower and cut into thin slices and florets. Peel and cube the potato into roughly the same size as the cauliflower florets. Mince the garlic cloves and add all of the vegetables to the steamer basket. Steam for 10 minutes, or until a knife easily glides through the cauliflower and potato. Carefully drain and place potato, cauliflower, garlic, goat cheese, salt and pepper into a food processor. Turn on the processor, and slowly drizzle in 2 teaspoons of grapeseed oil and taste for more seasonings. Puree until smooth. Lightly spray a 9 x 13 baking dish with olive oil cooking spray. Lay meatless mixture on the bottom. 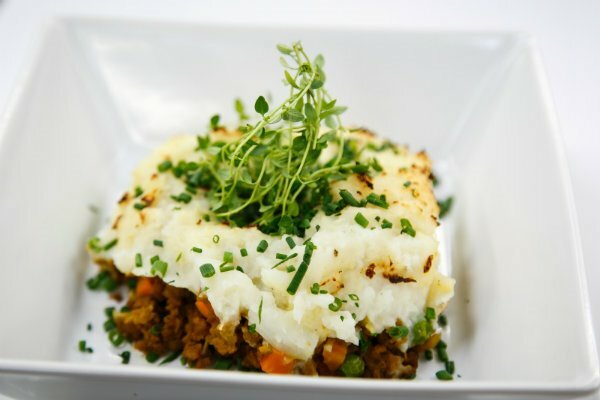 Scoop the cauliflower mash on top of the meatless mixture so you form beautiful peaks. Sprinkle with a touch of salt and pepper and cover with foil. Place in the oven for 20 minutes. Carefully remove the foil and broil for another 10 minutes, or until nicely browned. Take it out of the oven and top with fresh chive, and serve!